Margaret Thatcher – both mother and queen of the ruthless free market/growth-at-any-human-cost economic doctrine that is continuing on, spreading like a malignant cancer across the surface of the planet to this day. 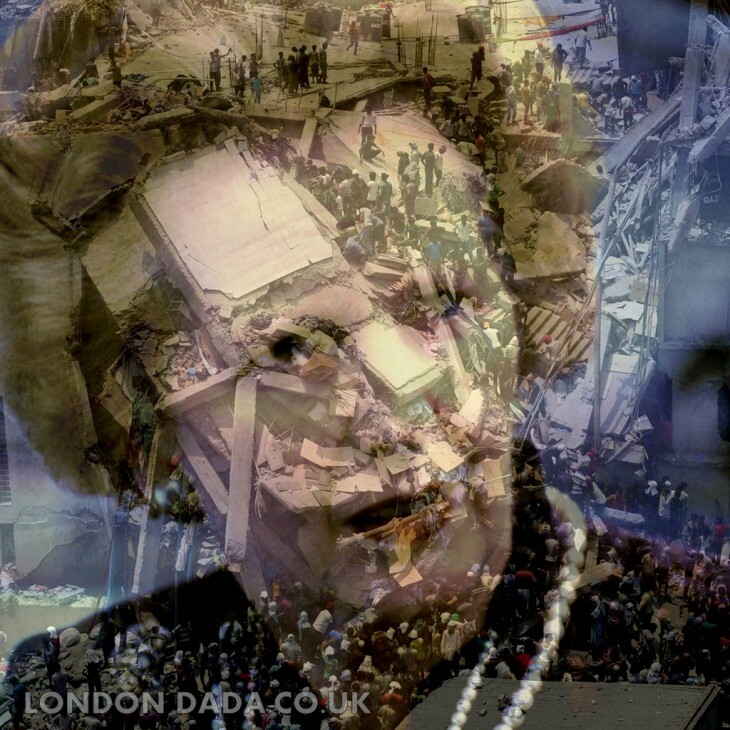 Appropriation collage superimposition of image of Margaret Thatcher over that of rescue scene at the site of the collapsed Primark sweatshop factory, Dhakar Bangladesh, causing over 1200 deaths and countless serious injuries -the story conveniently quickly sidelined and now virtually forgotten by the western media. Doubtless those poor workers who initially refused to go into the factory on the day of the collapse due to the increasingly ominous cracks appearing in its structure, only to be ordered in under threat of instant dismissal by the bosses and to subsequently die horribly… would doubtless have come under Thatcher’s category of “Moaning Minnies”.